we leave for our trip to MN tomorrow. I wanted to make handmade gifts for everyone I was going to see. I will be taking a blog break for at least a week. 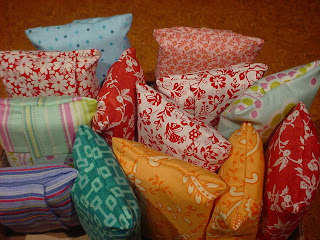 I made a pile of tissue holders, too. aren't they so fun? 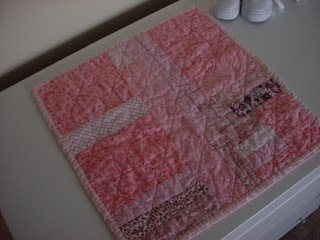 Now, as a disclaimer, I will tell you that I did less quilting than originally planned. For those of you who don't know, this is my friend's mom's quilt that has been a work in progress for more than 40 years...possibly 60 or more? 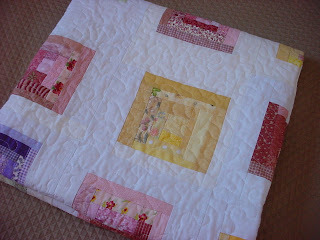 The top was pieced and the borders were pieced (all by hand) and I assembled the top into one piece. 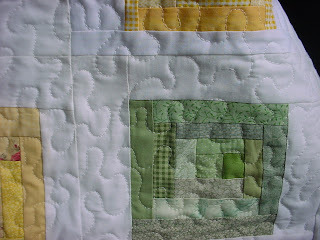 It is all hand quilted. 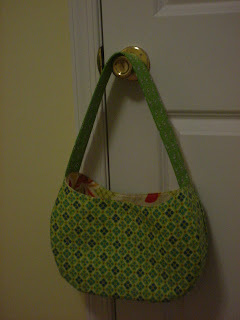 I am pleased to have this WIP off my list...and I am looking forward to giving it back to Judy, complete. I picked up this chair several years ago at Savers for a couple of bucks. It moved with us to Michigan 2.5 years ago. 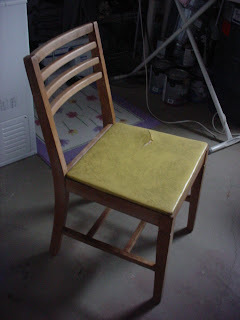 Nothing had been done with the chair, and my husband had threatened to use it for our campfire one time last summer. So, I figured that I better do something with it before it was too late. 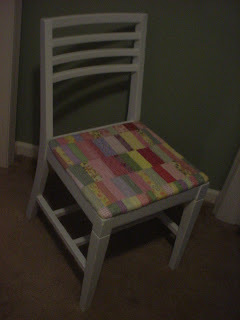 It's amazing what some white paint and a little patchwork seat cover will do for an old chair. 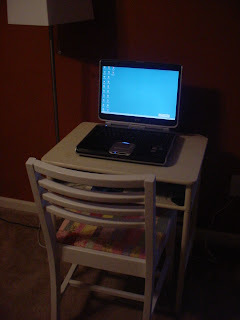 Here is where I usually sit and blog. 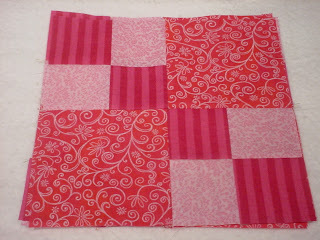 Here are my first 5 of 15 quilt blocks that I made for Linda's quilt block swap. 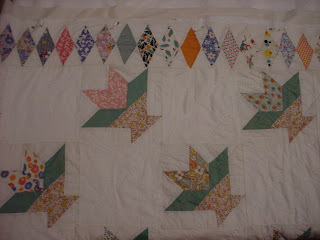 I needed a bit of an instant gratification project to work on to save my sanity, as I am still working on this. 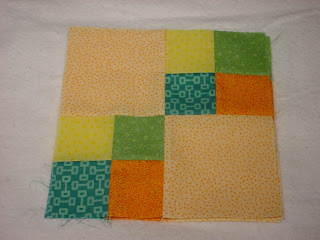 It felt like a bit of a test....other quilters are going to see the backs of my blocks. I'm a little nervous about that. Most days I have a hard time sewing a straight and consistent 1/4 inch seam. 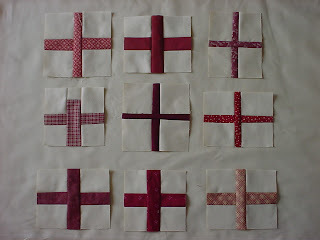 Why do you think I love improvisational piecing so much? Now, just 10 more blocks to go. A note about the buttons...my husband asked if I had mentioned that he bought most of them for me. He bought some on eBay a few times and then he picked up several here and there on clearance a few years back. Isn't that sweet? I then hinted that it may be time for some more. ;) They sure do come in handy for those $5 coats. 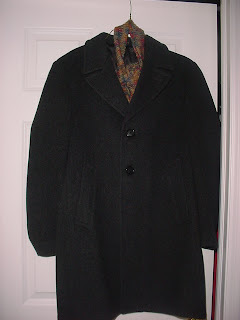 I picked up this wool coat today for $5.00. It fits perfectly. I need to sew a button on, (it didn't come with an extra), but I am not too worried. I also got some new jeans there for the same price. This is why I love Goodwill today. Wouldn't you? My trip to MN is in a week and a half. 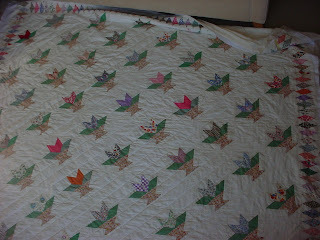 That is also my self-imposed deadline to finish this quilt. I am anxious to see if I can accomplish this goal or not. I am exactly half done with the quilting at this point. And then I need to decide what fabric to use for the binding. Did I mention that this quilt is huge? On a side note, I have pared down my expectations for myself. I was originally going to try to finish this quilt along with two others to hand deliver on my trip to MN...yeah, what was I thinking? I also have to figure out what to wear to my cousin's wedding, which will no doubt entail some shopping...and I need to decide what 3 of the other 4 people that live in my household will wear. Oh, it's going to be fun around here in the next week or so....plus packing. I guess I 'd better get busy! 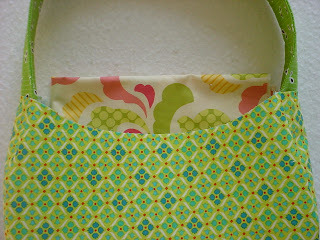 ...a new quilt for my son, using mainly scraps. 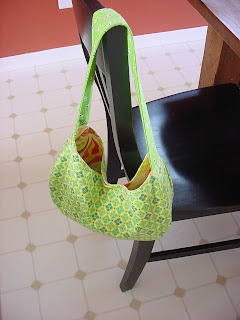 This purse worked out much better than the last one. 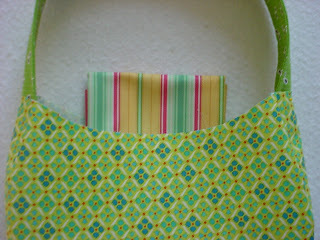 I made two little pockets instead of one larger one, mainly to use up my little interfacing scraps. It's going to look so cute with my pink coat! 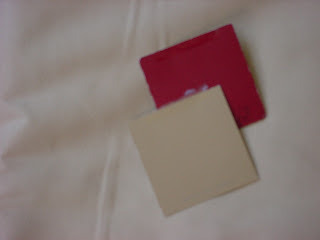 These are the paint colors in my boys' room. I purchased 5 yards of the light khaki fabric. 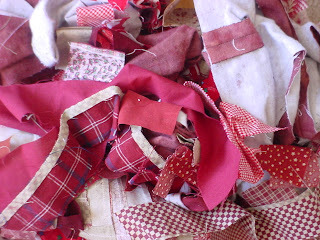 And after I add a bunch of red fabric scraps, hopefully I will come up with something like this. 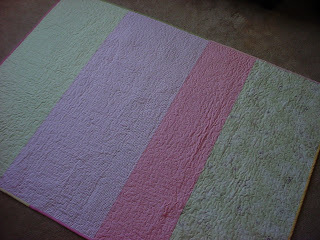 Have I mentioned how much I love to improvisationally piece quilts? I absolutely love it. LOVE it! And after this quilt turned out so much better than I had ever imagined, I am excited to try a new project along the same lines. This new quilt will be for my oldest. 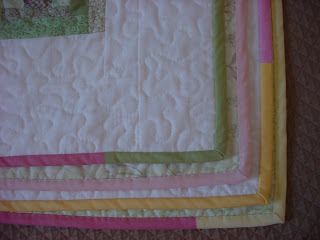 His current quilt is over 4 years old and is well used. 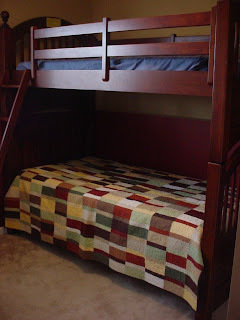 And since the younger one inherited the plain spoken quilt, I need to get busy on a new quilt for the top bunk. The plain spoken quilt (pictured above) was originally made to be a throw over the couch or chair in our upstairs living room. It somehow made it down to the family room and was there for a few weeks. The other day I had a bright idea: it would go well in the boys' room. It matches perfectly and it really looks great with their bunk beds. 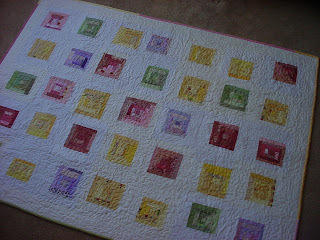 This quilt is versatile...it matches every room in my house, one bathroom excluded. I didn't realize this until it after I had completed it, just how well it coordinates with my entire house. 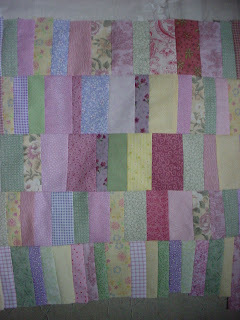 Mama Urchin asked (a few post ago already) what I did with all my quilts. I give away almost half of them (as gifts), and I use the other half. 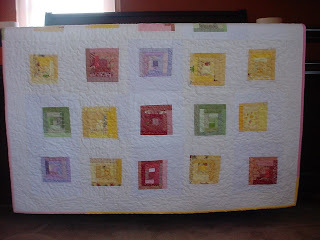 Last year I made 12 quilts, gave away 5. The rest I kept for my immediate family and we use them in our home. 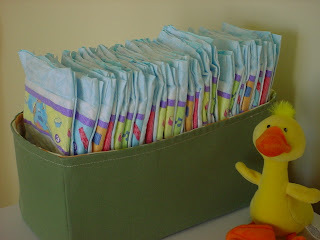 Let me put it this way...I am looking for a quilt cupboard...it's getting to that point. We love quilts around here. Really. Thanks for stopping by, for checking in and for your comments. I appreciate it so much. This is what my purse looks like when filled with all my stuff. It's got a saggy middle, much like me. (hee hee hee). Not quite sure what to do about the purse. 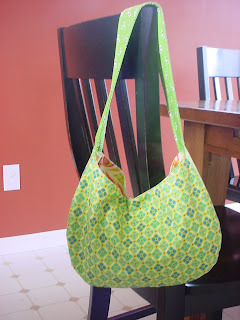 Now, on to something else, since I am getting sick of looking at this purse. 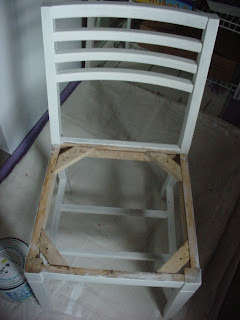 Priming and painting an old chair. And making some patchwork to recover the seat. Fabric A. won with 18 votes. I appreciate your input. Thanks for voting! 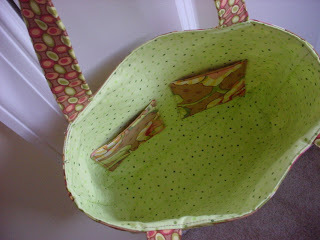 I even made a little side pocket to hold my cell phone. 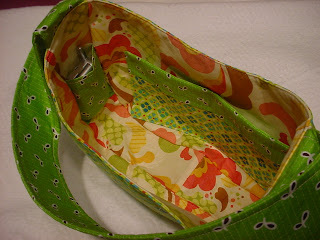 Has anyone used magnetic closures for their purses? Are they hard to put in, and line up? 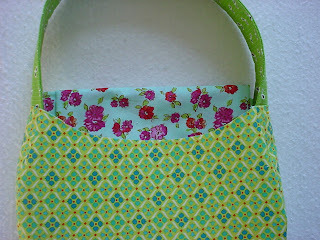 I am working on a new pattern for a purse. Which fabric would make the best lining? I am hoping to share the tutorial with all of you, soon , if you are interested. I just need to get all the bugs worked out first. 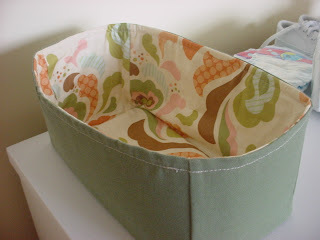 So here is my (very plain) version of the fabric box. 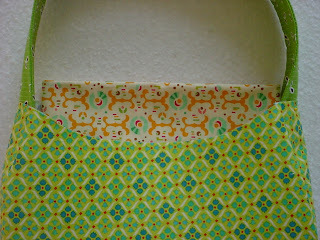 I cut my pieces 6" x 6" and 6" x 12" to fit little A's diapers. 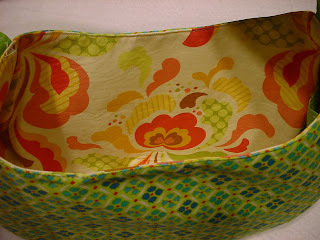 It's lined with some of heather's fantastic fabric. It's functional. And now looking at the photos, very, very plain on the outside. I have to keep it full, in order to maintain it's shape (I used fake timtex for the first time), but that's a minor detail. And it still turned out heaps better than my own version. 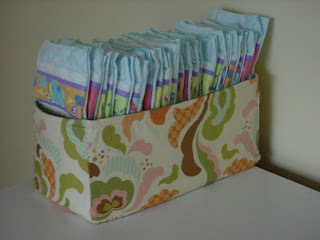 I just realized that if I turned it inside out, I have one fantastic diaper box. And on a side note, one of the authors of this book commented on my humble little blog on my plain spoken quilt. How fantastic is that?????????? Well, I finished another quilt, and I think this is my favorite so far. The colored blocks are made almost entirely out of scraps. Thanks to Clair, Amy, and Taia for contributing their scraps. 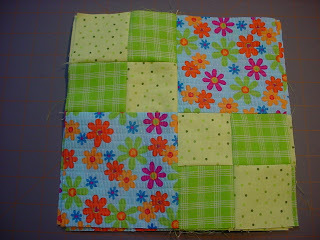 The pieced backing with surprisingly few puckers. This did require some quality time with my seam ripper. 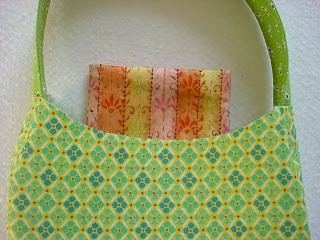 The binding is pieced using 6 different solids to complete the scrappy look. 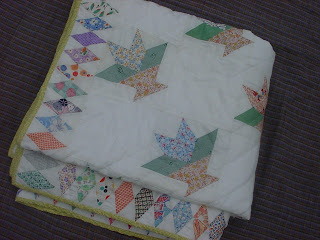 Inspiration came from this quilt and this quilt. I'm back from my unplanned blog break (no internet connection for 3 days). It was enough to drive me nuts! I've missed you guys. 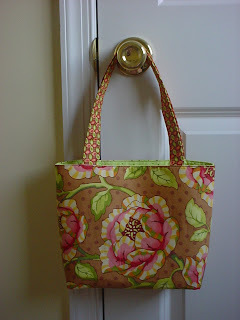 I got caught up on my sewing job which is a huge relief. 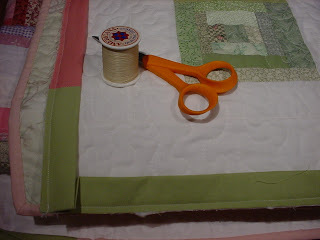 I am doing a hand quilting marathon....trying to get this quilt done before my trip to MN at the end of the month. It's a full size quilt. But you already know that I am crazy. I guess this is proof if there was any shred of doubt. My daughter has a bad cold and 3 teeth coming in. She is miserable. Therefore the rest of us are miserable. It's been a rough couple of days on the parenting front. 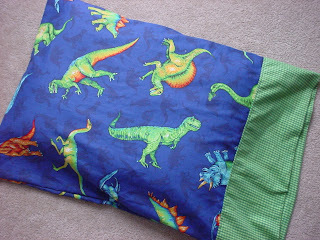 I made a new pillowcase for my 4 year old....he got it less than a week after his birthday, so we were all pretty happy with that. This is my compromise to decorating a room around a theme/character....we change pillowcases on a whim (as their tastes change), but the rest of the boys' room is a pretty basic boy room. No character bedding, etc. Pillowcases are my one concession. It works out pretty well. Dinosaurs are a big hit around here these days. I also made these bars. I highly recommend them. They are good for breakfast, lunch, dinner, snack, anytime really. I also made some of this....also good. My second try was much more to my liking than the first. It's a tough pill to swallow...I've made fun of people for making their own granola. Now here I am doing it....hmm. I want to try to make a wardrobe of skirts for this summer, but I am not a garment sewer...yet. I like the looks of this skirt a lot. Can you tell that I've missed blogging? So there is your earful...hopefully it will be back to normal around here soon. 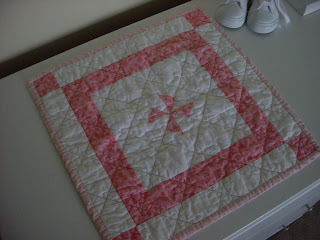 A little doll quilt I made for baby A.
Ummm, yeah, we kinda love quilts around here.